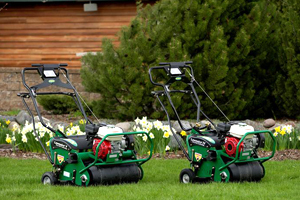 Ryan offers an impressive variety of professional turf equipment to really make your lawn stand out. 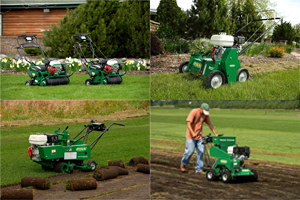 From aerators and dethatchers that help a lawn thrive, to seeders and sod cutters that bring a new yard to life. 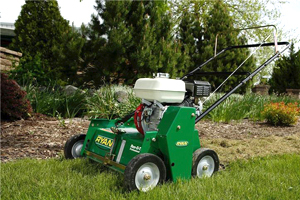 Proudly produced in the U.S.A, Ryan has been providing professional landscapers with heavy-duty, commercial-built turf equipment for over 60 years and counting. Ryan produces three different types of aerators. 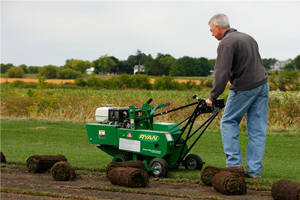 Whether you're a homeowner, or professional contractor, there's an aerator that's just right for you. Walk Behind: 19 - 28 inch clearing width self-propelled aerators. Tow Behind: Wheeled or tractor-mounted aerators. 3-Point Hitch: Compatible with a category "0" or "1" 3-point hitch. Removing thatch from a lawn allows the new grass growth to receive the proper light, air, and nutrients it needs. A dethatcher or power rake helps remove this layer of thatch buildup on your lawn. Choose between the Ren-O-Thin Power Rake or the Mataway Self-Propelled Dethatcher to give your lawn a long deserved grooming. 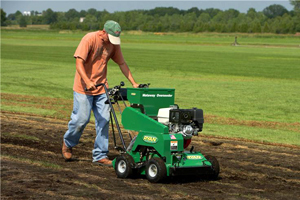 Perfect for seeding a distressed lawn or filling in those bare spots, the Ryan Mataway seeder plants grass seed directly into the existing turf to improve the density of your lawn. The Mataway seeder is built with a seed depth guide, so you can change the rate of seeding for different grass varieties, ensuring your lawn is properly seeded from the start. From the sod farms to your local golf courses and sport fields, the look and feel of high quality sod brings out the best of your turf. The Ryan Jr. Sod Cutter is easily transported, making it very convenient to use on golf course properties. The Ryan Heavy-Duty Sod Cutter is capable of cutting and rolling up to three acres of sod a day. Increase productivity and keep costs down with a new Ryan sod cutter.